Holidays like the 4th of July or New Year's Eve are a time that many of us associate with watching fireworks. However, did you know that manufacturers rely on X-ray diffraction (XRD) technology to help ensure that they’re using the right materials in their fireworks? Different materials have different burn rates, so knowing that you’re using the correct chemical formulation is important for user safety. An essential component of fireworks is fuse materials that burn at a certain rate. When a firework is lit, users need to know how much time they have before it goes off, and this is determined by the burn rate of the fuse. Most personal injuries caused by fireworks occur as a result of fusing materials that burn much too fast, causing the fireworks to go off in the individual’s hands. During times of the year when fireworks are widely used, such as New Years and July 4th celebrations, many hospital emergency rooms see a dramatic increase in hand injuries, some of them very serious to the point of possibly losing fingers, or worse. The fusing components of the fireworks are important for safety, and they are engineered to burn at very specific rates of speed. This affords the pyrotechnician a level of certainty that a minimum safe distance exists from initial ignition to final timing for cascade reaction. Our XRD analyzers offer manufacturers and end users the opportunity to check that the formulations of their fireworks are the correct type for the desired entertainment effect. More importantly, XRD can also be used to confirm that the fusing materials come from an approved source and are correctly formulated to achieve a predictable and repeatable burn time. The TERRA® and BTX II™ analyzers use identical powder-XRD technology to identify compounds. 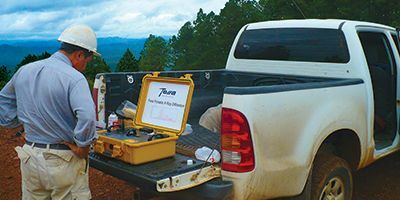 The BTX II analyzer is a small benchtop unit typically used in labs, while the TERRA analyzer is fully portable and is battery operated. Both instruments are equipped with a unique powder handling system designed for easy sample preparation of small powder quantities (less than 15 mg).